Transform your bedroom with the beautiful contrast of the Intelligent Design Renee Floral Print Duvet Cover Set. 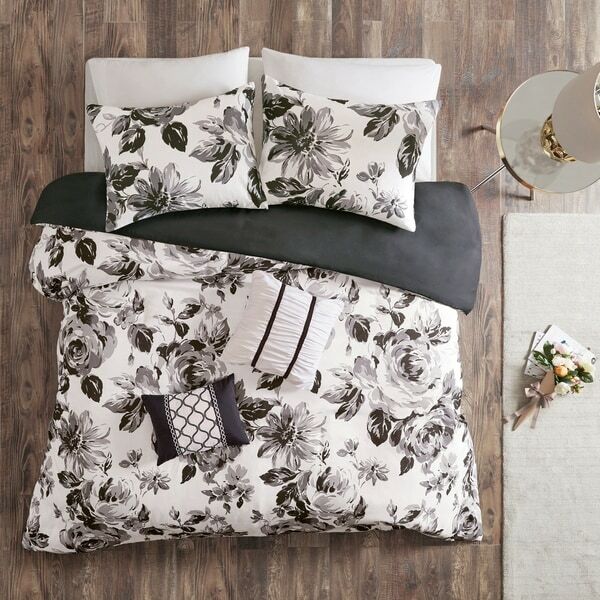 The ultra-soft microfiber duvet cover and sham(s) flaunt a floral print in black and white for an elegant appeal. A solid black reverse on the duvet cover complements the top of the bed with a bold touch. Two decorative pillows with hypoallergenic filling are also included to complete the bedding set. Machine washable for easy care, this floral duvet cover set adds a stunning transitional look to your bedroom décor. Button closures, on the duvet cover, allow you to place a comforter insert within the duvet cover and four internal corner ties help prevent it from shifting (insert NOT included). I'm not too thrilled about this duvet cover set. Doesn't lay straight on the bed and is the type of fabric that catches static electricity easily. The colors are beautiful and it's not badly made. I would prefer something with a little more cotton in it. The duvet and pillows look as pictured. Really looks great in my daughter's room with pink accents that we added. We didn't use the decorative pillows as we had pink ones. Great value and soft. I was very excited to get this cause I love the color and design, but I was very disappointed. The quality is horrible. It’s as thin as tissue paper and the blanket inside kept slipping around everywhere because of its texture. I would not recommend, we started a return right away.